Decent enough Wetherspoons - most cask ales were a bit on the strong side, but Ruddles was great value at £1.85! I must disagree with the comments of realalerules83, if he has an objection to draft (?) he should go to a bottles only establishment. Also if beer offerings 'was' paltry surely that infers to one beer only, as opposed to beers in the plural. However you don't need good grammar to appreciate good ale and I have never had a bad pint in this pub no matter how I asked for it. Not a bad 'spoons but as it is very close to several other real ale pubs we only had a swift one to say we had been in! As has been said - if this bar was in any other town apart from Sheffield then it would be brilliant! Cold and uninspiring poor effort by Wetherspoons. The beer offerings was quite paltry. A never ending draft circulated at the bottom of the stairs where I sat. Not a good start to the days proceedings. 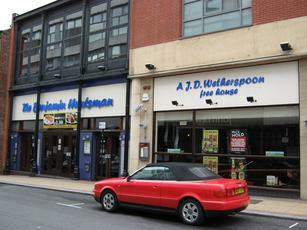 Good standard wetherspoon pub with friendly staff.